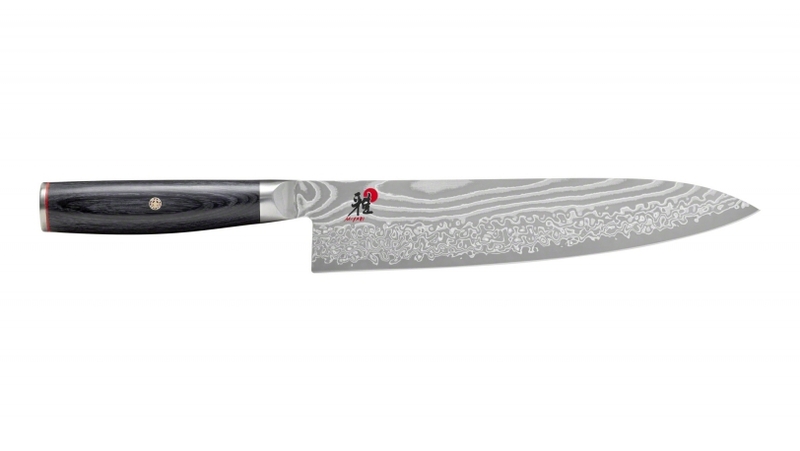 The Miyabi 5000FCD GYUTOH is perfectly balanced, contains a unique Damascus design and an incomparable edge. With a blade length of 24 cm, it is ideal for cutting meat and large vegetables, the Japanese equivalent of the European chef's knife. The knife includes an FC61 fine carbide steel blade core and is covered with 48 layers of steel. This gives the blade a unique damask pattern, and an exceptional hardness of about 61 Rockwells. The FRIODUR® ice hardening process further enhances structural integrity and makes the knife sharp, flexible and resistant. This knife is sharpened by hand in the purest Japanese tradition, according to the traditional "Honbazuke" method which gives the blade an incomparable edge. It also has a D-handle in "pakka wood", a very resistant assembly of wood and resin, all inlaid with a mosaic and completed with a steel end cap surrounded by a fine red border. The Miyabi brand, with its statement "The Beauty of Sharpness", reflects values that are particularly highly prized in Japanese culture. The brand is synonymous with purity, grace and elegance. Miyabi knives combine beauty and exceptional sharpness. They are thus manufactured in the tradition of the ancient masters, who once produced the finest Japanese swords. Miyabi knives are authentic. They are designed by the Japanese and manufactured in ZWILLING's own factories in Japan.